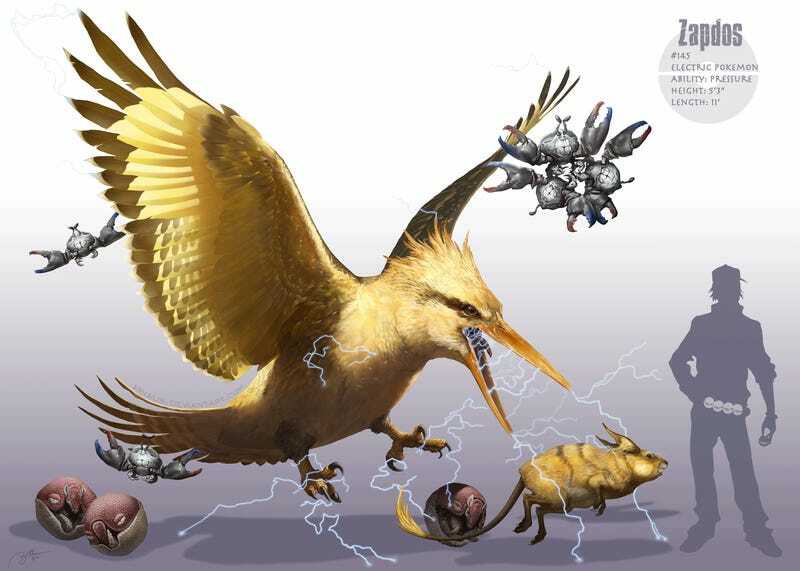 Six years ago, artist RJ Palmer started drawing Pokémon as though they were realistic dinosaurs. Those sketches, done for fun, led to him getting the job of a lifetime: working on the Detective Pikachu movie, which we got our first real look at today. I mean that in the most literal sense; Palmer says that the film’s production designer hired him when he googled “realistic Pokemon” and our posts on his 2012-13 art came up. Palmer—who by day works at Ubisoft’s San Francisco studio (Rocksmith, South Park: The Fractured But Whole)—spent about seven months on the movie in 2016-17, and contributed a bunch of Pokémon designs. If you’re wondering why any Pokemon needed to be redesigned, watch the trailer again: while Pikachu has essentially just been given more visible fur, other guys like Charizard are looking far more fleshed-out. We’ll hopefully get a look at those closer to the film’s release in 2019, but for now, I thought it’d be fun to look back at his earlier stuff, more of which you can see collected here.